International Rescue and Relief Team 2017 with the Ambassador. We arrived in Nicaragua to a hot and humid January. We met our new bosses and 21 students that we would be spending the next three months with. Surprise! Our living large does include working. We are working with a University as clinical instructors for their International Rescue and Relief degree. 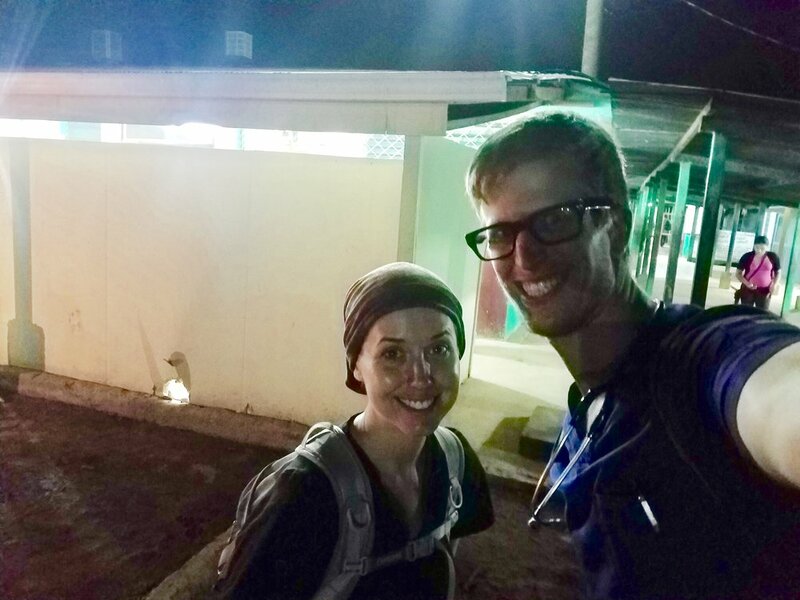 We started with 2 weeks of intensive classwork including my favorite class Travel and Tropical Medicine taught by an amazingly gifted local doctor. Rapids in hand-hallowed canoes, EVERYTHING must be in dry bags, people can't stand in lines and wait, clinics go till it's too dark to work, everyone has worms (including me), when it rains it pours, children make the cutest patients, grisi sickness is a mystery, chloroquine Sunday, rice and beans, everyone speaks Mosquito not Spanish, and the landscape is breathtaking (insert Jurassic park theme song). Yes, some of the list is comprised of “you had to be there to understand” statements, but maybe it gives you a glimpse into what an incredible expedition this was on many tiered levels. One of the river villages. The next highlight was hospital rotations. We rotated 21 students in 3 specialities: emergency department, labor and delivery, and surgery. The opportunities were incredible for each student. My highlight of the week was being able to “catch a baby”. The baby was too fast for the student who was putting on her gloves at the time. So I got to assist the doctor with the delivery because a good clinical instructor is always ready: gloves on and waiting incase help is needed. I worked a 90 hour work week and it was Valentine’s week. Nathan and I snapped an “after shift Happy Valentine's” photo. This was our glamorous reality. Swim for your life to a paradise with no food. Next, was what the students classify as the pinnacle of the semester: survival week. Survival week looks easy on paper: 3 days jungle survival, 3 days coastal survival, and 24 hour open water survival. In reality it's an experience where you learn your limits and when, in my case, this is your second time completing this week you face the challenge of already knowing your breaking points and having to push yourself to those limits and beyond again (mental battle 2.0). Jungle survival consisted of hiking 3 miles into the jungle with two local guides, forging for food, swimming in the river, learning skills, meeting a 7ft snake, and having the locals donate food to us because they couldn't figure out what in the world these “gringos” were doing with no food. Coastal survival was a beautiful panga ride out to the Pearl Key islands off of Nicaragua. These are private islands many owned by multi-millionaires. Our boat sunk...theoretically so we had to swim to our tropical paradise. It was literally a paradise without food. Well there was coconuts, but after three days of coconut water, coconut meat, and more coconut means that none of us are up to eating coconut anytime soon. 24-hour open water survival was just an experience for Nathan and the students. I opted out. I know my limits and when you get seasick on the 2.5 hour panga ride to the island as an instructor you get an opt out card “I don't get graded and I definitely don’t get paid enough for this” card. Simply to say Nathan thrived. Spring break, it's one of the perks of contracting to work for a University, and we spent it on Little Corn Island. Little Corn is little and is only 2.9 square kilometers. Basically, here you eat, sleep, eat, and scuba dive. Nathan got to dive for the first time in 9 years and I got to gear up for 20 minutes. I'll be learning how to dive in a swimming pool. Starting off a boat in the ocean is not quite at my comfort level yet. So back to eat it was for me. I had many calories to replace after survival. Little Corn Island for Spring Break. My man and I. THE LESS YOU HAVE THE MORE VALUABLE WHAT YOU HAVE BECOMES. From my backpack of belongings to seeing a people valuing every grain of rice I've been shown the value of less. I am simply going to leave that thought withoutexplanation. It's an unfinished contemplation for me and a contemplation I am still actively experiencing. Just know that even living large in Nicaragua one learns the value of less.